There’s some recent alarming news yet simultaneously comforting news for those in the New York City region concerned about coastal flooding. On one hand, two geologists have assembled a 2000-year record of hurricane storm surges that washed over the area’s barrier islands, leaving layers of ocean sand in the muddy bays behind them as evidence. Your ears might perk up if you live on Rockaway, Long Beach or other area barrier islands. On the other hand, their results suggest that there were very long periods with no flood layers, so probably no hurricane strikes. 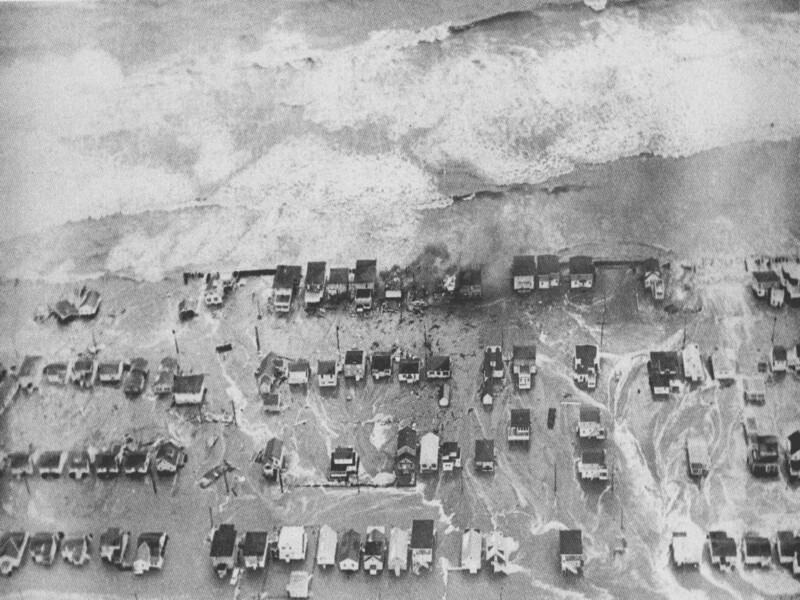 The periods in the records that are thought to have had warmer tropical ocean temperatures actually had fewer hurricane strikes near NYC. Due to global warming, we are likely to have warmer ocean temperatures, so this may reflect the surprising result that global warming might reduce the number of hurricanes striking NYC’s plentiful shorelines. 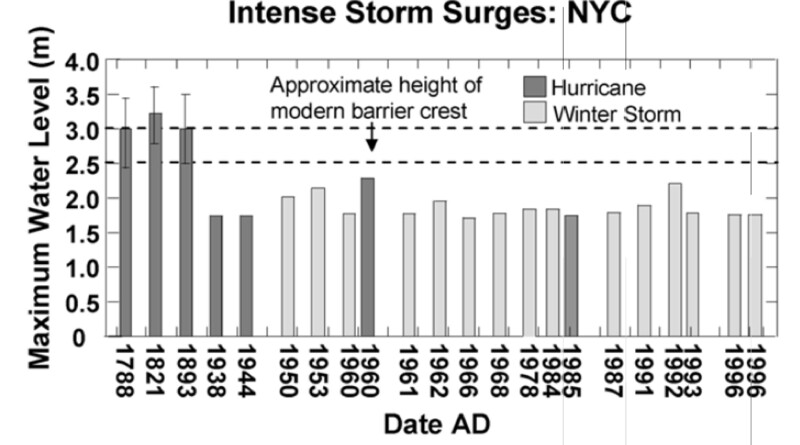 This figure below from their paper shows the water levels for several of the worst storms in recent centuries, measured at the southern tip of Manhattan – the storms at or above the second dashed line were also observed as sand layers in the sediment cores behind Long Beach. The average height of the modern (2002) barrier island crest (2.5-3.0 meters) is shown with the two dashed lines. Note that these are water levels in the Harbor – water levels at the beaches are higher due to (a) periodic wave run-up and (b) piling up of average water levels due to wave breaking – called wave set-up. Of course, this doesn’t change the fact that we need to be ready for The Big One. For one thing, this is only one scientific study, though it seems robust. Even if the results are solid, the difference between one hurricane in fifty years and one in five hundred is still all about probabilities. The damages of a direct hit would likely be in the tens of billions, and millions of New Yorkers might need to be evacuated, so we still need to take some basic precautions and be ready for the worst. Thinking further ahead, there’s one factor I haven’t mentioned – if global warming causes a meter of sea level rise by the end of the century, you can see from the figure above that an intense winter storm that occurs perhaps every decade or so (2.0 meter surge) will begin to feel like The Big One (3.0 meter surge) when it comes to storm surge flooding. But that gives us plenty of time to put the homes on stilts, build seawalls in place of beaches, and get the grandkids swim lessons! On the other hand, their results suggest that there were very long periods with no flood layers, so probably no hurricane strikes. The periods in the records that had warmer tropical ocean temperatures actually had fewer hurricane strikes near NYC. Due to global warming, we are likely to have warmer ocean temperatures, so this may reflect the surprising result that global warming might reduce the number of hurricanes striking NYC’s plentiful shorelines. This figure from their paper shows the water levels for several of the worst storms in recent centuries, measured at the southern tip of Manhattan – the storms at or above the second dashed line were also observed as sand layers in the sediment cores behind Long Beach. The average height of the modern (2002) barrier island crest (2.5-3.0 meters) is shown with the two dashed lines. Note that these are water levels in the Harbor – water levels at the beaches are higher due to (a) periodic wave run-up and (b) piling up of average water levels due to wave breaking – called wave set-up. Of course, this doesn’t change the fact that we need to be ready for The Big One. For one thing, this is only one scientific study, though it seems robust. Even if the results are solid, the difference between one hurricane in fifty years and one in five hundred is still all about probabilities. The damages of a direct hit could be in the hundreds of billions, and millions of New Yorkers might need to be evacuated, so we still need to take some basic precautions and be ready for the worst. Thinking further ahead, there’s one factor I haven’t mentioned – if global warming causes a meter of sea level rise by the end of the century, you can see from the figure above that an intense winter storm that occurs perhaps every decade or so (2.0 meter maximum water level) will begin to feel like The Big One (3.0 meter level) when it comes to storm surge flooding. This entry was posted in water, weather and tagged barrier island, beach, Coney, Donnelly, flooding, hurricane, island, Long Beach, New York City, Rockaway, Scileppi, sea level rise, storm surge, wave. Bookmark the permalink.